It’s a classic sitcom bit of comedy. Usually someone fills the washing machine or dishwasher with way too much soap and the room becomes to fill with foamy soap suds. No matter how stupid the show, it’s always a fun bit to watch. That’s kinda like what this is, except on a much larger scale and with foam. Safety personnel at the Fort Indiantown Gap Army Reserve base in Pennsylvania need to make sure that the foam fire suppression system actually works before they bringing any planes into its new helicopter maintenance training facility. Financially, it’s important. So how do you do that? 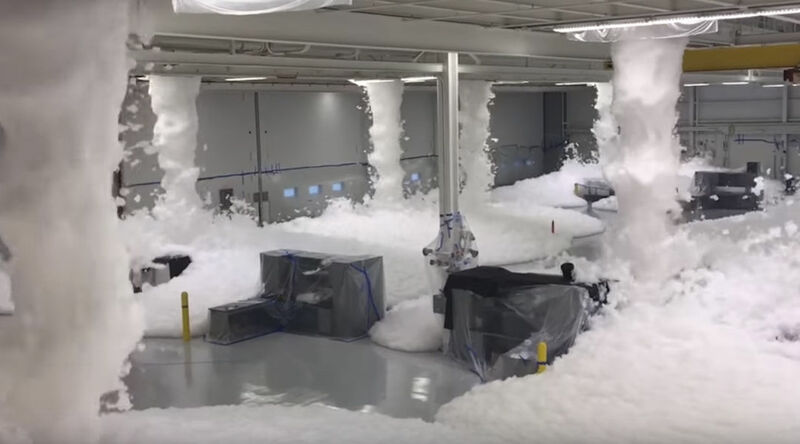 You just let the system do its thing and fill a giant room with foam and try not to yell, “LUCY!” It is a cool test of the emergency equipment. This foam is normally used where there are highly flammable liquids, since it helps to smother mixtures like fuels so that oxygen can’t reach them and feed a fire more. Large waterfalls of foam fall from the ceiling everywhere and it doesn’t take long until it covers everything. There’s gotta be someone just off camera in a protective suit, just frolicing and having his own personal snow day.